One of the best banking classes in Pune that help you achieve your dream job! Looking for quality-oriented banking classes in Pune? Lotus IT Hub – a name synonymous with expert bank exam training provides the most rigid and in-depth guidance for bank job aspirants. There are a couple of banking coaching classes in Pune, but what makes Lotus IT Hub stand apart from them is the quality of coaching and unique teaching methodology. We have been providing bank exam training in Pune for last 8 years. We leave no stone untouched when it comes to preparing candidates for various banking exams. The topic covered include Quantitative Aptitude, Reasoning Ability, English, IT, Current affairs and Banking. 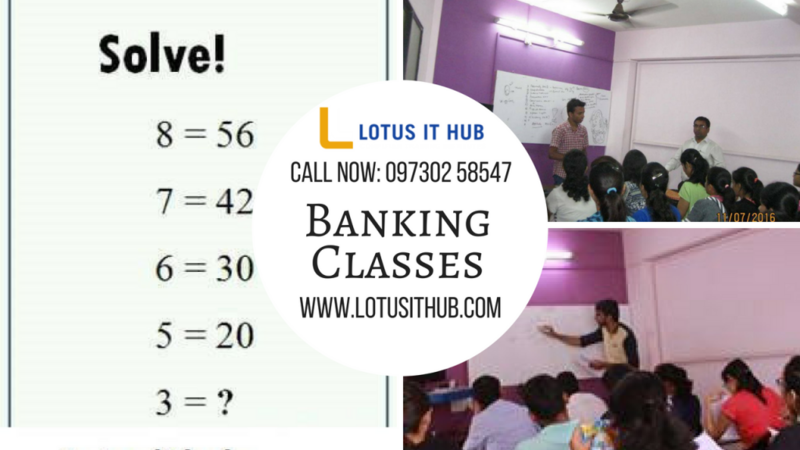 What makes Lotus IT Hub the most preferred name for banking classes in Pune? 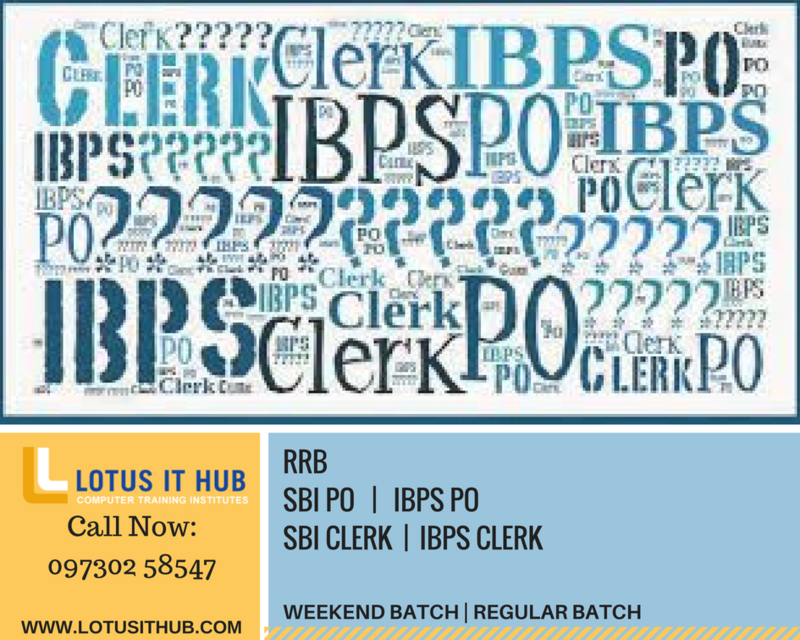 At Lotus IT Hub’s IBPS training and coaching classes in Pune, we give special attention to each individual and look that there no doubt remains unsolved or stuck. So, are you ready to crack Bank PO / IBPS/ Clerk or SO exams? If yes, join Lotus IT Hub Today! – one of the renowned banking classes in Pune. We get down to the bedrock of all concepts and prepare you for the different banking exams in the smartest way. Limited seats left at the best banking coaching classes in Pune, enrol today! Hurry Up! Let’s set the concrete base of your career at Angularjs classes in Pune! If you are in a search of Angular js training institute in Pune then I bet you, that you’re trying to find a way for your career. And that’s absolutely fine because you are chasing the right track. Lotus IT Hub in Karve Nagar Pune has the prolific trainers from the different fraternity who are eagerly waiting to guide this enthuse talent. When we think to learn any software language then, we must know two basic things; first its future scope and second do it helps to achieve your target? Characteristic features of the Python Classes in Pune! As per the expert’s opinion Python is the easiest language to learn and used which make you stand firm in this perfectly competitive nest of software. Python classes in Pune will give you that new high-level approach with its English like syntax. It is generously easy to learn and easy to extend language if you get proper professional guidance. It is cross-platform and can be used anywhere with other languages with different libraries and frameworks. This flexibility increases the features of the standard Python library. How Python training in Pune makes you specialize in the field? Scripting language concept which is applicable to build large-scale applications. It can be integrated with C, C++, COM, JAVA, etc. At Python classes in Pune, you will understand the applicability of the language on different platforms and servers. SQL database administration is one of them. Python is also a leading machine learning language and has a large user base. When it comes to dealing with large amounts of data Python, code as T-SQL script enables the machine learning capabilities, directly. SQL Server technologies work with in-memory tables and column-store indexes. Python code is also very easy to deploy and can be written directly inside of any Transact-SQL command. Python training institute in Pune is all set to provide their aspirant basic to advanced knowledge about the language. Python programming paradigm treats computation as the mathematical evaluation of the functions. Lotus IT Hub, Pune takes the privilege to boost up the young talent and make then qualified enough to stand ahead in the competition. Lotus IT Hub is situated in Karve Nagar Pune, where we are providing all software languages classes along with the complete preparation batches for the government competitive exams. For more detail, you can visit our website www.lotuithub.com or you can visit our premises and experience the free demo classes. Python is an interpreted high-level programming language. It is easy to learn because of its scripting and programming advantages. When it comes to quick and crisp application development then Python is the first choice for developers. To learn complete Language join Python classes in Pune, here you will receive a practical implementation of the language with its theoretical knowledge. Why one should join Python Coaching Classes in Pune? At Python training in Pune you will learn its Unified Feature which is used in commercial enterprise applications. Due to its multi-features, unit testing, Speed and high control capabilities with nested protocol network it increases the gross productivity of the application. Its implementation in commercial application is taught by the trainer in the Python training institute in Pune. Python is comprised of third-party modules which have the Python Package Index. It is capable of interacting with most of the languages and platforms. It is OSI approved Open Source and Community Development language which make it distributed and free to use in numerous modules. If you are thinking to join Python coaching in Pune, then we are famous for our coaching techniques, as we have well-sorted training patterns with the proficient trainer. We teach from basic to the advancement in that particular language. For beginners, we give them basic training from installation whereas repeater can also resume with us. Lotus IT Hub is the reputed computer training institute in Karve Nagar, Pune provides you with the easy way to learn and understand the Python language. Python is globally used official programming language, for which we provide coaching as well as practical tutorials. Make your quick move to join widely acclaimed Python Classes in Pune. To know more about us you can visit our website www.lotuithub.com or visit our premises in Karve Nagar, Pune on given address. Find the best Banking Coaching Classes in Pune near you! Among the thousands of people, when you think about your career then you encounter with the random thoughts and get confused. So, now just get relaxed! Take a long breath and join Banking classes in Pune. Lotus IT Hub in Pune is the training institute renowned for their top notch professional guidance and productive result. It is one of the best banking exam training institutes in Pune has a record of student selection in the bank exams every year. As you know for banking lacks of applications come and thousands will get selected, so to cater this difficult path you needed a proper supervision with time management skills, which you will improve at bank exam training institute in Pune. To go through all the tier of banking exam you require a step by step guidance, and disciplined coaching. We have a talented tutor who is well prepared and scheduled guideline structure for their aspirants. As per the candidate requirements and exams patterns like IBPS PO, SBI PO, IBPS SO, RBI PO, RRB, etc. according to that we have the coaching pattern, syllabus, and notes, are available. At our Banking coaching classes in Pune we have an unbiased and an interactive teaching environment for all our aspirants. How IBPS training classes in Pune will help you in trekking this mountain? When we think to build the foundation of our banking aspirant’s career, then we make their base firm on which they are going to build the sky scrappers of their future. We have a team of passionate people who will teach their student how to reach the pinnacle of success. To crack the banking exams like IBPS, SBI, and RBI we have brilliant faculty to give you a fantabulous result with the banking classes in Pune. IBPS is one of the tough exams, and for that we provide special coaching to emphasize its importance to the student. Lotus IT Hub, Karve Nagar, Pune is an elite banking training institute in Pune with its outstanding faculty. They have student centric teaching facility for all the banking exams like IBPS clerk, IBPS PO, RBI PO, and many more. They are available on all digital platforms will e-notes. 24/7 guidance with exhaustive study material and test series are the forte of the banking coaching classes in Pune. To get the more information you can visit our premises in Karve Nagar Pune or visit our website to look after our services. Thinking to take a step ahead in a competition joins English speaking classes in Pune. English is the universally accepted language spoken by the millions of people around the globe. To walk on a parallel path with the world join the best spoken English classes in Pune. For the aspiring candidates English is not the language, it is an unstoppable flow of knowledge which gives you the confidence to stand firmly on the world stage. The best spoken English classes in Pune award you that assurance of performing on any platform to achieve the success. English Speaking classes in Pune is an amazing journey to operate, but while doing so we take care of every aspect and perspective of people who are directly or indirectly involved in the process. Communication: It’s easy to mug up the syllabus and score, but English is not that easy to learn and moreover to communicate, for that you need practice and guidance from experts which you can acquire at English speaking classes in Pune. Collaboration: Being an individual it is very important to portray an image in a crowd, the best English speaking classes in Pune teach you that self-presentation skills. They teach how to put your opinion in front of people without disrespecting them or without hearting their sentiments. Creativity: Everyone has that hidden artist inside but we help them to that out and do some innovative things which help them to boost up the confidence. English Speaking classes in Pune gives you Platform for standing firmly on a world stage. English is an International language for communication it is the only medium for surviving out the country, therefore it has this much importance. To make your future perspective clear and learn English from an expert professional then join English speaking course in Pune. LotusITHub is located in Karve Nagar Pune, if you are aspirant then don’t waste your time and seize this glorious opportunity. Join our Spoken English classes in Pune to carve your future by your own way. Are you looking for best Python classes in Karve nagar ? You have landed at the right place. Lotus IT Hub offers best Python training in Pune. Python being a very popular programming language, many students will to pursue learning it. It has lots of benefits and does have a great scope too. Best part of learning Python language is, there is no need of core knowledge of other programming languages such as C, C++, .NET and Java. Any student or working individual can easily learn Python programming language. Python is an object-oriented language with dynamic linguistics. In today’s world, if you want to succeed in IT sector, being an all-rounder is very important. IT professionals must learn Python language to compete well in the IT industry as the language has great importance and i used to program CGI for internet applications. So where can you get best Python courses in Karve nagar? 6 reasons why Lotus IT Hub is the one stop solution for Python courses in warje? Cost-effective- Being in this field for years, the founder of Lotus IT Hub understands the value of learning new technology and updation of technical knowledge. Hence, to facilitate students and working people, we offer you best Python training in Pune and best class Python courses in warje, pune at a very reasonable cost. Anyone can join- We do not have any barrier of trainees’ criteria. It is not at all mandatory for you to be a student only. Not only students but also people with different backgrounds such as Automation engineers, quality analysts, DevOps, Data analyst, System administrator, UI developers, etc can get the benefit of learning Python. Time flexibility- We offer number 1 Python courses in Pune and do not want our students to miss any class due to their office and college timings. We have certain sets of classes arranged in different times to facilitate our students. Practical projects- We being one of the best Python classes in Pune, let our students work on practical live projects. It helps them get the proper idea how to work on the language and how to implement the codes. Experienced lecturers- Lotus IT Hub has highly experienced and skilled professional resources. Our resources not only possess good experience, but also help students get good opportunities from career point of view and deliver number 1 Python training in Pune. Other facilities- We do have computer systems with good configuration, spacious classrooms, comfortable chairs, proper parking and good quality projectors. This makes us best Python classes in Pune. Call today to get benefits from the best Python classes in Pune. Lotus IT Hub is the right place to get robust Python training in Pune.